Fall in love with France on this incredible trip featuring the country’s most beautiful sights. 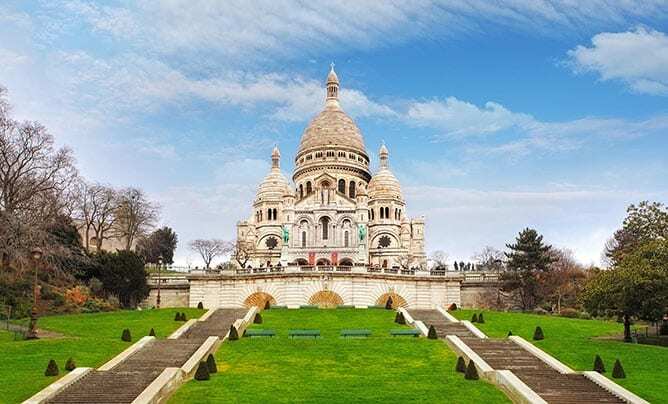 No trip here would be complete without a visit to Paris—you’ll see the Eiffel Tower, Arc de Triomphe, Panthéon, and so much more. Admire the inspiring floral scenery of Giverny and Monet’s House & Gardens, and then revel in the beauty of Mont St. Michel and Normandy’s breathtaking beaches. Visit the old world villages and numerous charming castles around Loire Valley before returning to Paris to experience more sights, food, and culture. From here, you’ll take a train to explore the medieval city of Avignon and Aix-en-Provence, the arts capital of Provence. Round out this marvelous trip with a stop through Cassis, a quaint fishing port, before ending with a relaxing stay in Nice. *Mont St Michel and Montmarte are hilly with lots of stairs and might pose a challenge for those with difficulties walking. Your fascinating France tours begin this evening with an overnight flight to Paris. Arrive in the beautiful city of Paris, also known as the “City of Light.” For centuries, Paris has been one of the world’s most important cities and certainly one of the world’s most beautiful. Not only is Paris the capital of France, but Paris is considered the global capital for cuisine, art, fashion, and more. After being picked up at the airport by your Tour Director, you’ll be taken to your upscale hotel. You’ll have some time to say “bonjour” to Paris before a welcome dinner at a a local restaurant. After breakfast, enjoy a guided city orientation tour of this magnificent city. See the Eiffel Tower, Champs Elysees, Arc de Triomphe, Place de la Concorde, Latin Quarter, Pantheon, Place Vendome, and the Paris Opera. This afternoon is at leisure. In the evening you may wish to take a stroll along the famous River Seine, where you’ll savor spectacular views, before you select an authentic Parisian restaurant or cafe for dinner. After breakfast, travel to the lovely town of Giverny. The town rose to fame in 1883, when the famous impressionist Claude Monet “discovered” the village and moved there. Here, enjoy a visit to the Monet House and Gardens and see firsthand the inspiration for many of Monet’s most famous works. Your next stop is Rouen, one of the largest and most prosperous cities of medieval Europe located on the River Seine. Upon arrival in Rouen, the capital of Normandy, you’ll enjoy a walking tour and visit the famous (and imposing) Notre Dame cathedral, which was the subject of a series of paintings by none other than Claude Monet. You’ll also visit the Place due Vieux-Marche (or “Old Marketplace”), where Joan of Arc was executed for heresy in the 15th century and where a church in her name was built in 1979. Continue your journey and arrive at your hotel in Caen, in the heart of the Normandy region. Note: Mont St Michel is hilly with lots of stairs and might pose a challenge for those with difficulties walking. Today travel to the rugged coast of Normandy and savor the breathtaking views of magnificent Mont St. Michel, built on an isolated island in the gulf of Saint-Malo. Designated a UNESCO World Heritage Site, Mont St. Michel is reached by causeway. The lower towers and medieval sea wall protect a small village, capped magnificently by the commanding Abbey dedicated to the Archangel Michael. You’ll enjoy a visit of the spectacular interior of the Abbey, which was designated as a monument historique in 1874. Prior to the causeway, Mont St. Michel was on an isolated island that pilgrims could approach mindful of a tide that could seep in at any time. Return to Caen. Spend a remarkable day experiencing and learning about one of the most famous days in history: D-Day. You’ll visit the Normandy Beaches, including Omaha Beach near the coastal village of Colleville-sur-Mer. Omaha was one of the principal beachheads where the U.S. Army stormed ashore on D-Day (June 6th, 1944). Explore Pointe du Hoc, located between Utah Beach and Omaha Beach, where a group of American Army Rangers defied all odds by scaling a massive cliff at a critical moment during the invasion. Continue to the Normandy American Cemetery and Memorial, a spectacular and emotional setting located on a bluff overlooking both Omaha Beach and the English Channel. You’ll later visit the city of Bayeux, home to the world famous Bayeux Tapestry and the fortress of William the Conqueror, before returning to your upscale hotel. The rest of the day is at leisure. Morning at leisure to explore Caen (Normandy) independently before traveling to Loire Valley, famous for its old world villages and charming chateaux (castles). En route, pay a visit to the Chateau and Gardens of Villandry, the last of the great Renaissance chateaux built on the banks of the Loire River. The estate’s renowned architecture is matched (if not surpassed) by its magnificent gardens, which are spread across three levels and are truly a sight to see. You’ll continue to your upscale hotel, where you’ll enjoy an included dinner. This morning, you’ll visit Chateau de Chambord, the undisputed crown jewel of the region and arguably the emblem of the French Renaissance. Originally a weekend hunting lodge for King Francois I in the early 16th century, the Chateau evolved into among the most expensive (and excessive) architectural projects by a French Monarch. Continue to Chateau de Chenonceau, the second most visited chateau in France (behind Versailles), where you’ll be blown away by the magical architecture that was constructed in harmony with the beautiful River Cher. On the way back to your hotel, enjoy a delicious wine tasting at the magnificent Caves du Pere Auguste winery, with a wide variety of refreshing wines to enjoy. Return to your hotel, and your evening is at leisure. Note: Montmartre is hilly with lots of stairs and might pose a challenge for those with difficulties walking. After breakfast, travel back to Paris for your second taste of one of the world’s greatest cities. Perhaps consider an optional excursion to Versailles for a fascinating visit of the Chateau and the brilliant hall filled with mirrors and chandeliers, numerous galleries, salons, and royal apartments, all lavishly decorated and fitted with ornate furnishings. The magnificent fountains supplied by almost 100 miles of pipes, spray jets of water in a forceful dance. You will also have an opportunity to explore the palace and grounds at your own pace. You may wish to take a stroll along the famous River Seine, where you’ll savor spectacular views. This evening, enjoy dinner at an authentic Parisian restaurant in Montmartre, a famous section of the Right Bank (“Rive Droite”) in Paris. After breakfast, you’ll head to the Paris train station and board the TGV train to the historic city of Avignon in the heart of Provence. En route, be sure to admire the beautiful landscapes of Burgundy and the Rhone Valley. A charming medieval city that was home to seven successive popes during the 14th century, Avignon will wow you with its imposing Gothic architecture, magnificent art, and fascinating history. Upon arrival, you’ll enjoy a guided city tour, highlighted by the Palais des Papes (Papal Palace), one of the largest and most important medieval Gothic buildings in the world. You’ll also marvel at the iconic bridge Pont Saint Benezet on the Rhone River, better known as Pont d’Avignon because of the famous French song that the bridge inspired in the 15th century called “Sur le Pont d’Avignon.” Later, arrive at your upscale, centrally located hotel in Avignon and enjoy an included dinner this evening. This morning, travel to Cassis, a quaint fishing port famous for its cliffs and sheltered inlets (calanques). Boasting a picturesque harbor and quintessential Provençal houses, Cassis will be the launching point for your spectacular calanques cruise, featuring France’s version of fjords with its inlets surrounded by dramatic rocky cliffs. After your cruise, continue to Nice, the capital of the French Riviera (Cote D’Azur), where you’ll check into your centrally-located hotel and spend the evening at leisure. Or, perhaps you might enjoy an optional excursion to Monte Carlo, a glittering center of international high society and home to a world-renowned casino. With the beautiful blue waters of Cote D’Azur as its backdrop, Nice is one of the most beloved cities in all of Europe, blending old-world opulence with a lively cosmopolitan vibe. Long recognized as one of the gems of Europe, Nice changed hands several times between the French and the Italians before eventually settling in as part of France. In the old city of Nice, you’ll discover the narrow streets and renowned Baroque architecture and enjoy a walk along the Promenade des Anglais (“Walkway of the English”), a famous promenade along the Mediterranean named as such due to the large number of English tourists who began flocking to Nice in the 19th century. The rest of your day is at leisure, or perhaps you might enjoy an optional tour of Grasse (the world’s perfume capital) and St. Paul de Vence (a medieval hilltop jewel). This evening, enjoy a farewell dinner with your group. After breakfast, say “au revoir” to your France tour and head to the airport for your flight back to the USA. Your exciting journey ends as you touch down in New York. Single room supplement is $799. Reservations can be made by phone (1-800-337-7773) and will be confirmed upon receipt of $300 non-refundable, non-transferable deposit which must be received within 48 hours of reservation. Full payment is due 75 days prior to departure. Baggage fees may apply. Space and prices subject to availability. For complete booking information and terms & conditions click here. To enhance your visit to France, your tour director will offer you optional tours. All rates are in Euros. Payment must be made in Euros (cash). Optional tours are subject to a minimum of 10 participants and may therefore be cancelled if this minimum is not met. Join an optional excursion to Versailles for a fascinating visit of the Chateau and the brilliant hall filled with mirrors and chandeliers, numerous galleries, salons, and royal apartments, all lavishly decorated and fitted with ornate furnishings. The magnificent fountains, supplied by almost 100 miles of pipes, spray jets of water in a forceful dance. You will also have an opportunity to explore the palace and grounds at your own pace. Join an optional excursion to Monte Carlo, a glittering center of international high society and home to a world-renowned casino. Enjoy a walking tour around town (one of the fanciest in the world) , and if you’re so inclined, try your hand at the casino. Note: Entrance to Casino Monte Carlo not included. Visit the town of Grasse, the world’s perfume capital. You’ll have a guided perfumery tour, and then you’ll stroll around the old town. Next, you’ll visit St. Paul de Vence, a medieval hilltop jewel. This is what many people dream of when they think about the South of France. From the 12th-century town hall to the 14th-centry church to the 16th-century fortified walls and cemetery, you’ll be walking back through history in this spectacular place. Your flights from New York to France and back are on the following airlines with the corresponding schedules. We recommend that you arrive at the airport at least 3 ½ hours before the scheduled departure. Please make sure to allow sufficient time for clearing customs and immigration if you are planning a connecting flight. We recommend at least 3 ½ hours. Please note that flight schedules are subject to change without prior notice. The above airlines do not accept advance seat assignment. Actual seat assignment will be provided at the airport. Please note that smarTours is not involved with your seat assignments. Main Tour: Land-only services start upon independent check in at hotel in Paris on Day 2 of the itinerary listed on our tour page. Land Services end after breakfast at Nice hotel on Day 14 of the itinerary listed on our tour page. You must be in possession of a passport valid for at least 6 months after the date of travel. Visas are not required for American passport holders. Non U.S. citizens should check with the respective consulates as to the most current visa requirements to all their travel destinations. Please remember that it is your responsibility to obtain the necessary travel documents before the trip. Your airline tickets along with final instructions and additional travel tips will be sent to you 10 – 7 days before the scheduled departure of your tour. Please make sure to advise us in case your address changes. You may expect daytime temperatures averaging in the 60’s and 70’s in the Summer and the 50’s and 60’s in the Spring and Fall. The hotels used on this tour have several dining choices from coffee shop to specialty restaurants. Average cost for dinner (excluding drinks) in a cafe is about $25-30 per meal per person. Optional sightseeing tours and evening activities will be offered. Your hotel will accept credit cards for your non-included meals. Hotels and some stores accept major credit cards. However, for “street shopping” you will need local currency. You can either exchange U.S. Dollars into local currency in advance of your trip, or you may use your debit card to withdrawal local currency from an ATM. It is recommended that you bring along cash in small denominations. Each passenger may bring one piece of checked-in luggage (no more than 44 pounds) and one carry-on piece (no more than 18”x10”x8”). We recommend that you do not over-pack and that you take a variety of separates with climate and comfort in mind. WE HAD A TRULY WONDERFUL TIME . France was different in all three areas, but our tour guide Victor made each area so out standing, you fell in love each time you entered a new area . The people were wonderful,and so kind and help full. All the hotels had great locations. Our tour guide Vic made it special for every one. We really had so much fun,I have shared our trip with all my friends. We also felt safe at all times. I owe my great trip to Vic the best guide ever. It really was a great trip......the chateaus, castles, countryside. My yaya's and I had a fabulous, interesting and informative overland voyage! The best contributor was our wonderful Patrick. He has a great understanding of your and his country.....knew so much history that he shared with us...was charming, had time for everyone, never left anyone out of anything and made all comfortable, and was just fun. All the guys with us wanted to spend time with him and all the women couldn't get enough of his company. Of all our trips I think he was the most interested and interesting guide/host. We did have a small group of people who were very well traveled and wanted to learn about France. I wish I had better words to explain how much we enjoyed France, but it wouldn't be the same when I come back without our Patrick! Thank you! This is my 49th year of international travel, and the 15th tour with smarTours -- I've even repeated South Africa and Thailand twice! I'm one of your biggest fans, and always promote the great tours you have to offer -- and at fabulous prices. This trip was no exception. We covered a lot of history -- and territory -- and it was worth it. What a wonderful introduction to a country. The people we were met were very nice, the landscape everywhere was awesome (there were flowers everywhere in June), and the history and cities we visited will remain with me forever. This was one of my favorite tours!! The Mercure and swimming on the roof deck pool with all of Nice at my feet was a stellar way to end the trip. A tout a l'heure! "Charl"
We were delighted with our recent 14 day tour with Marie Agnes. We had fellow travelers who were enjoyable, punctual and pleasant . The country side was charming , Normandy very moving, and Paris was magnificent, especially at night. Marie Agnes was knowledgable , humorous, and patient. The weather was beautiful (1 rainy day) and the food and wine delicious. Great tour! This tour was totally interesting. Great guide, great sites, ands great time. Singularly Outstanding to say the least. Our tour guide (Nadine)went the extra mile to keep us informed, entertained and made sure we had no problems during our trip. Well worth the money. Food great, hotels great, and the tour as a whole was awesome. I received value for my money. Many thanks. This was the most amazing tour. Our tour Director, Nadine LePlat could not have been more informative, vivacious, and more accommodating. I loved all parts of the tour: Normandy, Mount St Michel, the chalets, Paris, Avignon, Nice, and the boat ride in Marseilles. There was so much to see and do. The hotels were great. Loved every minute!!! I have never had such a wonderful time on a tour. Our tour guide Nadine Leplat was fabulous. Everything about the trip was great form the itinerary to the hotels. I would do this again. Au revoir France. Our guide Nadine Le Plat was wonderful. The itinerary was great.